Description: Shell minute, spire variable in height from low to moderately high (Figs. 1, 2). 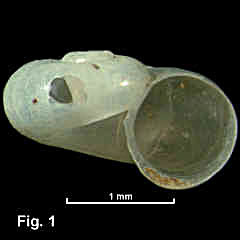 Protoconch of 1¼ whorls, apex slightly submerged.. Teleoconch of about 3 completely smooth, convex whorls. Aperture almost circular, outer lip simple, thin. Umbilicus widely open. 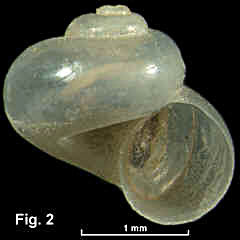 Shell transparent, becoming opaque white with age. Size: Up to 2.5 mm in diameter. Distribution: Presently known distribution is disjunct. In eastern Australia, a single location at Lizard Island, Qld, and then Clarence River, NSW, southwards to Malacoota, Vic. In WA, Rottnest Is and Albany in the south-west and Carnarvon on the west coast. Also Midway Island in the central northern Pacific Ocean (Ponder, 1990). The disjunct distribution is probably due to lack of collecting. Habitat: Living specimens are found under rocks intertidally. Most specimens available are empty shells from beach washup. Moderately common. Comparison: Shells similar in form to this species are found in several other families. In the Skeneidae, species of Cirsonella are similar, and in Tornidae, Vitrinella starkeyae is similar. In the Pyramidellidae, Pseudoskenella depressa Ponder, 1973 is similar but smaller. Synonymy: Microdiscula fragilis Laseron, 1954 is a previously recognised synonym. Remarks: Ponder (1990) studied the species in detail and reported on shell morphology, and animal morphology, anatomy and radula. Fig. 1: Port Hacking, NSW (C.159202). Fig. 2: Merimbula Lake, NSW (C.354959). Dried animal inside shell.